These reports document casualties of Navy personnel, whether by enemy action, accident, imprisonment, or disease. Deaths in both wartime and peacetime are covered. Reports were prepared by the U.S. Navy. They are arranged by casualty type - drowning, enemy action, aviation accidents, shipwreck - and presented chronologically. 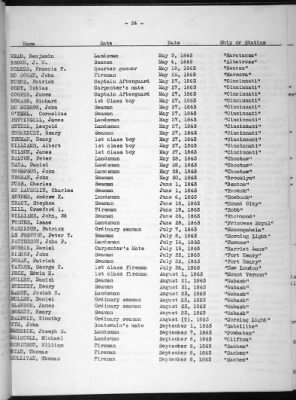 Most reports present the circumstances in detail with name and rank of sailor; others are lists of names, with rank, date of casualty, and location (ship or station). Wars covered include Revolutionary War, War of 1812, Civil War, World War I, and others.